Jorja Matchwick scored six tries. 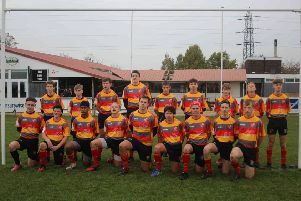 Peterborough Rugby Club’s Under 15 team stormed into the third round of the East Midlands Cup yesterday (November 4) as they chalked up their biggest win of the season in brushing aside Northampton Casuals 61-0. Lawrence Teague crossed for a try and kicked four conversions while Josh Webster celebrated a hat-trick of tries. Ethan Boughton scored his first try for the club while there was a brace for William Manning and one apiece for Ethan Manning and George Salisbury. Jacob Gent kicked three conversions and Tom Woolerson slotted another. The Under 15 girls were also big winners as they set themselves up well for their opening fixture in the National Cup by winning 104-7 in a friendly away at Sutton-in-Ashfield in Nottinghamshire. Liberty Ashdown was the top scorer with a hat-trick of tries and eight conversions, Jorja Matchwick crossed the line six times, Liv Hill crossed for a hat-trick, Jess Moorfoot went over twice and there was one apiece for Jas Murray and Courtney Lake. Holley Ross added four more four conversions. There wasn’t such good news for the Under 16 and Under 14 boys teams as both lost their opening fixtures in the East Midlands Cup. The Under 14s were beaten 29-24 at home against the combined team from Oundle and the Uppingham-based Stoneygate. Junior Little, Luke Farley, McKenzie East and Sam Neath had a try apiece, with Harry Missin successfully converting two of the four. There was a 48-12 defeat for the Under 16s away at Leighton Buzzard where prop Matt Waitman scored both tries and kicked a conversion too.